Established in 1999, Pacific Stonescape Inc. has grown to become the "go-to" natural stone supplier in the NW! We provide stone material for myriad landscape and architectural projects and serve a wide customer base from homeowners to landscapers, masons, builders and architects. We serve the Oregon Coast and Interstate 5 corridor, including Portland, Salem, Eugene, and Medford, as well as outside the region through our brokering and LTL shipping capabilities. 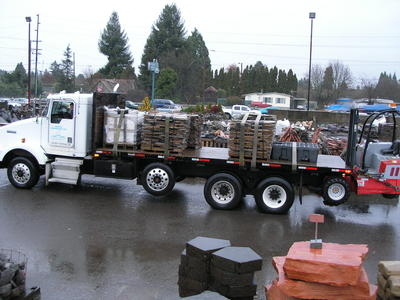 Please consider Pacific Stonescape for your next project - whether it is just a pound of river pebble for a fish aquarium, stone for a retaining wall, or 10 semi-loads of building stone for the home of your dreams! PLACEMENT SERVICES: Pacific Stonescape Inc. has VERY LIMITED placement capabilities. Our forklift is 8' wide and 8' tall. Curbside or driveway delivery is typical but we can, in some cases, extend beyond that depending on site conditions and safety - final discretion ALWAYS goes to our delivery driver! For more involved placement requirements we will be happy to refer you to someone who can get the job done! COUNTRYWIDE AND OVERSEAS PROJECTS: We are able to provide quarry-direct, full-load shipping via truck, rail/container or ocean/container to your project location and can be very competitive in doing so! We have solid relationships with very reliable suppliers & shippers and are confident we can get you the natural stone you need without the risk that these type of shipments can carry. LTL SHIPPING: Need just a few hundred pounds to a few tons shipped from outside our immediate region? We have recently negotiated much more competetive rates on these types of shipments. It still isn't cheap to ship small quantities of stone across the country but it may be more affordable than you think. Let us give you a quote!